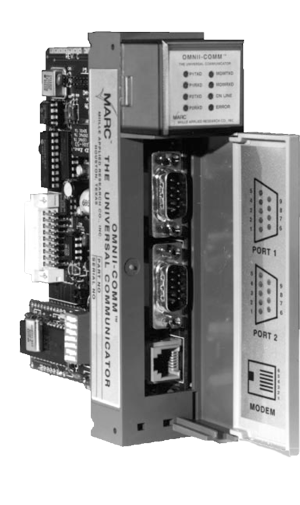 The MARC™Model 166-101 module is an FSK modem that plugs into one slot of an Allen-Bradley SLC 500 PLC and provides data communications with other Bell and CCITT Compatible modems at speeds up to 1800 baud. The modem provides reliable long-distance data communication on dedicated telephone channels, radio channels or local twisted-pair cables. Compatibility is assured with other modems using any of seventeen standard operating modes at speeds of up to 1800 baud. The modem is completely compatible with the widely used Bell 202 standard.